The UniFi Antenna, model UMA-D, is an optional mesh antenna designed to work with the UniFi® AC Mesh AP, model UAP-AC-M. With dual-band support, the UMA-D expands range coverage and provides customized pattern shaping. It is available in single- and five-packs. Antenna Features Optimized for 802.11ac, the UMA-D offers a high efficiency directional radiation pattern with dual polarity. Weather-Resistant Enclosure Encased in UV-stabilized plastic, the UMA-D can be used indoors or outdoors. Versatile Mounting The UMA-D has a ball joint mount designed for precise aiming and can be mounted on a pole or wall. 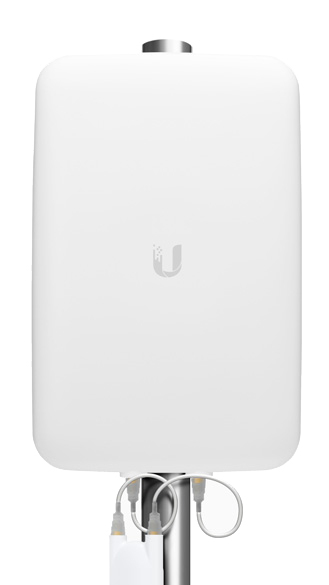 Compatibility The UMA-D is a connectorized antenna that is compatible with the UAP-AC-M.
Download the Ubiquiti UniFi Mesh Antenna Datasheet (PDF).